I would like to meet at a bar for a quiet drink where we could encounter in a nice conversation..and see how we get on ...now please please young men from19 to 49? .don't contact me i will block u OK .and if you have photo then don't contact. Me.i have ? Temption is a Female dating in Waterford, Ireland. 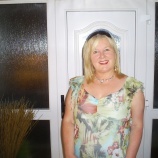 Check the description of this 60 years old profile, she is White/Caucasian and Other maybe this matches your profile description and you can both start dating in Ireland for free. The stars says she is a Aquarius maybe you should check your horoscope and match up your star sign.